As health awareness spreads rigorously, dental patients have begun to take concern seriously with regards to the material that comes in contact with their bodies. The impact of this health awareness has lead patients to weigh the pros and cons of one dental substance against the other. Hence, this article explores the features of dental implants such as ceramic implants and titanium implants. When it comes to dental implants, the choice should be to use the least reactive and toxic material available. Your criteria to judge implants should include strength, clinical success, and proper evaluation. Over the years, many patients have shown distrust towards implanting metal in their mouths. The avoidance has given rise to an alternative material, zirconia, as opposed to the traditionally successful material titanium for dental implants. As health conscious patients frequently pose questions to the use of harmful materials, this article explains that it is important to understand the potential benefits, limitations, risks, and other factors of both ceramic implants and titanium implants. It is not so simple to rank one higher than the other without specifically understanding the complexity of both. 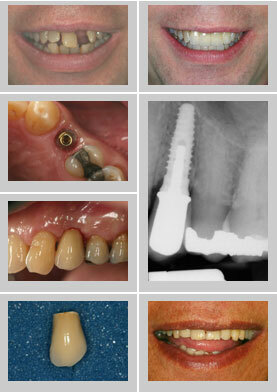 Ceramic implants, also known as zirconia, appeal to patients with its non-metal like property. It is ceramic, white in color and has an atomic number of 40, which actually makes it a transitional metal that has a crystal structure containing both metallic and non-metallic atoms. 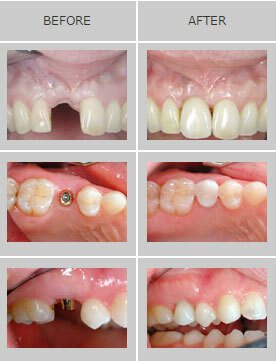 Zirconia implant crowns, however, function differently from traditional metals. They cannot be re-adjusted or be used with flexibility as they are compatible only as a one-piece design. Zirconia has strong compressive forces but brittle elastic forces, meaning they are more susceptible to breakage. When installing zirconia implants precision is necessary as they are secured via cementation. These implants are highly suited to individuals who may be allergic to titanium implants. Titanium implants involve a base and an upper structure, the process is lengthy as two components are installed for restorative purposes by enabling the jaw to integrate with the crown. A titanium implant is successful because it is highly resistant to damage and corrosion. These implants are also less prone to breakage as they are metallic. They are not as rigid and can adjust to changes fairly better than Zirconia. However, both titanium and zirconia are very bioinert materials. They do not cause local inflammation and are accepted by the body, which makes the two materials suitable choices for the implant system. The differences between the two mainly lie with pricing, healing, and durability. The common risk associated with dental implant is an infection caused by bacteria or poor oral activity. The risk of infection can be subsided or significantly minimized by consulting renowned dentists at Bixby Knolls Dental Group, who are dedicated to serving the Long Beach area. Bixby Knolls Dental Group seeks complete patient satisfaction and comfort by providing comprehensive dental care all under one roof. Located in Long Beach, we are a friendly team of qualified professionals dedicated to quality by employing the latest innovations in dentistry. If you’re looking for a dentist near you, book your consultation with a wonderful dentist from our highly qualified team of individuals!